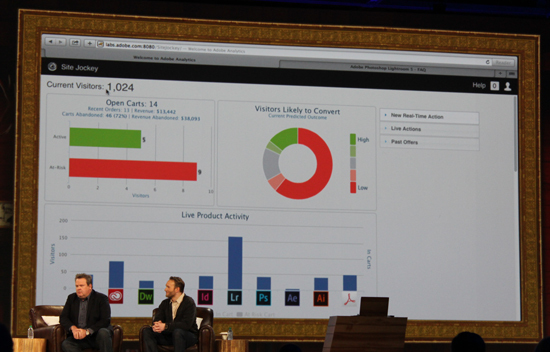 SALT LAKE CITY, UTAH – Typically software vendors keep their forthcoming product features pretty close to the vest, but not so with Adobe Systems Inc.
At Summit, its digital marketing conference, Adobe showcases several product features in beta stage or even earlier in development in a presentation that’s part nerdy developer ogling and part entertainment. (Actor Eric Stonestreet from TV’s Modern Family co-hosted this year’s showcase). In the “Sneaks” presentation, Adobe asks the audience to tweet feedback on Twitter using specific hash tags and ranks the features in a sort of competition that could help determine what gets investment priority. Some of the product features do make it into the generally available version of Adobe’s Marketing Cloud suite and some don’t. One feature showcased at last year’s Summit by Sid Shah, director of business analytics for digital marketing at Adobe, was called CMOBFF at the time and promised to predict where their marketing budget would be most effectively spent. 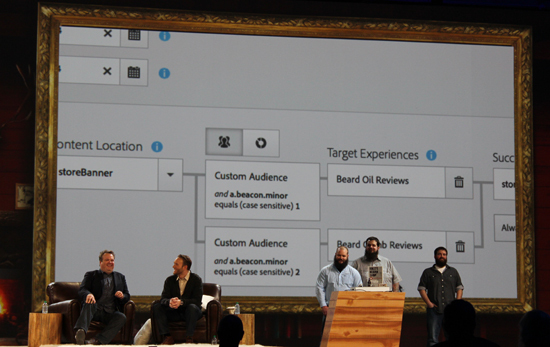 Now that feature is called Adobe Media Mix Planning and it is soon to be rolled out for live use. It will use both online and offline data and crunch them with algorithms to predict how effective a marketing spend will be. Customers are already lined up for Media Mix Planning and it should be live in a few weeks. After Shah demonstrated his victorious feature from last year’s Sneaks presentation, it was on to the six new feature previews. Craig Mathis, senior research scientist with Adobe, showed off Site Jockey, an add-on for Adobe Campaign that gives insight into real-time customer behaviour on your website. Just like a DJ can change the music according to the mood at a party, marketers can take a look at their customers and decide to take action based on their behaviour. “In other words these are the people on my dance floor,” Mathis says. For example, you could see how many shopping carts are open at the moment, categorized by the risk of being abandoned. A marketer can focus on the people not likely to convert and give them a nudge in the right direction. A real-time action pane shows your options about what to do – add an overlay on the website, invite the customer to chat, or notify other Adobe products about what’s happening. A marketer could even set up a test and offer a discount to see if it results in a conversion. Mathieu Hannouz, senior product marketing manager at Adobe, laments that event triggers aren’t sent in real time, so he’s set out to change that. “We’re missing the opportunity as marketers to reach a person at the moment of truth,” he says. A feature that’s built into Adobe Analytics and Campaign, a real-time event trigger could allow a marketer to make an offer to a person that just abandoned a shopping cart. Or perhaps send a push notification to a person’s mobile phone that just entered a retail store location, signalled by iBeacon. Behind the scenes, what makes the trigger work is a new function in Campaign that listens for specific events from Analytics. So a marketer would need both products to execute on this. 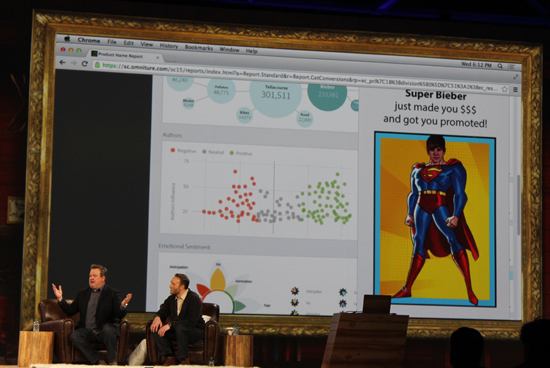 Ben Gaines, senior product manger for Adobe Analytics presented this new feature for his product. For marketers, segments are groups of audience members that have something in common. Perhaps they read the company blog at least once a week, or they are loyal shoppers at the online store. Uber Segments would let Analytics administrators quickly create new segments by combining ones that already exist, without the need to go through the setup process all over again. The job is done by ticking check boxes and quickly produces visualizations of activity charts and graphs. Marketers can then share the segment with others in their organization so they can access it and apply it to reports. 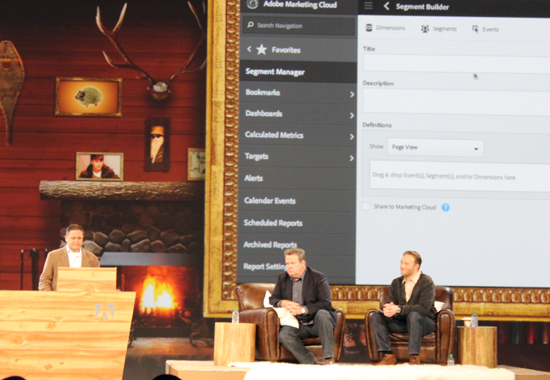 The segment can also be published to the marketing cloud to be accessed by other Adobe products. This feature is in beta and will be available in a few weeks. An Adobe duo presented this new feature: Kevin Smith, engineering manager and Alan Wilson, virtual design manager. It involves a connection to the Creative Cloud and namely Illustrator. Marketers typically create infographics using Illustrator – sometimes for reports to their boss, sometimes for public consumption as content – but wouldn’t it be cool if they could use those info graphics to monitor an ongoing effort rather than as static graphics? 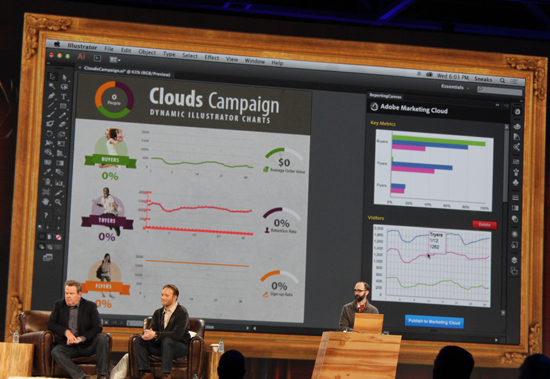 This feature plugs Marketing Cloud data into Illustrator. A designer could create a graphic template with areas for charts to be generated by data from Marketing Cloud. Data is bonded to a graph and then calling for an update will cause it to change to reflect to most recent data. Marketers will be able to publish the reports to the marketing cloud so others can access them, and update the data whenever they like with the click of a mouse. Not only will it help reports look slick, but it will save marketers from having to do repetitive tasks to update reports. Carmen Sutter, social product management at Adobe, showcases this new feature for Adobe Social. Adobe Social already tracks a company’s product names on social media and analyzes the sentiment around them, and this feature will allow a marketer to dig into a product and see what notable events are happening that could have impacted sales. In Sutter’s example, security camera footage of Justin Bieber riding a bicycle circulated social media. Once people found out what type of bike Bieber was riding, that became part of the conversation. So the retailer that sells that bike can see those talking about the event in both a positive or negative way and decide what sort of message to send out in response. Kole Winters, a software engineering manager at Adobe, seized upon Adobe’s newly announced support for Apple’s iBeacon with his new feature for Adobe Target. Since iBeacon uses Bluetooth low-energy wireless to detect nearby smartphones and send them push notifications, Winters set up an imaginary retail store to demonstrate the feature. At this Salt Lake City beard store, Winters toured Stonestreet around to shop for a beard that would look good on his clean-shaven face and all the accessories he’d need with it. As they approached different products, Stonestreet’s iPhone was sent a push notification with information about the item. 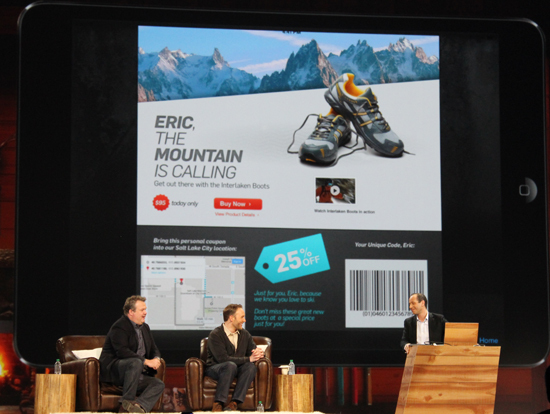 Marketers could also choose to take actions in real-time to respond to iBeacon triggers. They could send a message welcoming someone to a store, for example, or push them a discount offer.